Italy, the home of coffee in many forms, from a quick shots at the bar to more complicated creations with foams, chocolates and sometimes ice cream. They certainly love their coffee in Italy and this infographic created by National Positions sets out to explain a few of the different coffee styles you can expect to find in the country. 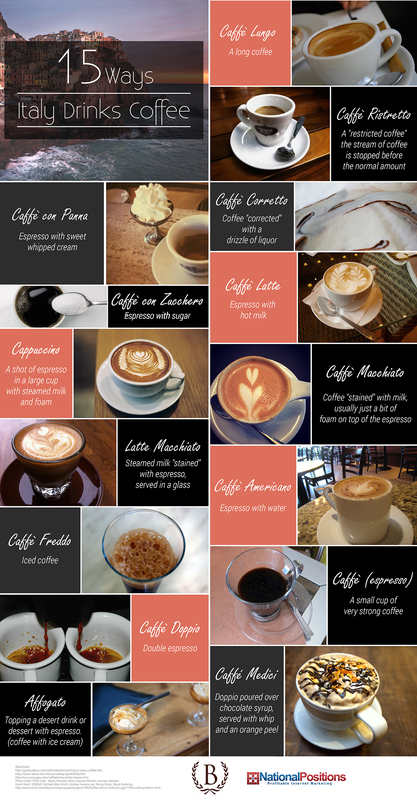 There’s 15 different kinds of coffee listed on the infographic - starting with the simple espresso and moving on to the latte macchiato, caffe freddo and affogato. The infographic lists the names and exactly how each one is made, a handy little resource for any coffee lover heading to Italy on their holidays. Here's a look at what your coffee choice says about you.